Most states and the federal government have restrictions on harvesting wild ginseng, so the home grower must use purchased seed and grow the plant under cultivation. The home gardener, under the right conditions, can grow cultivated ginseng roots, but the plants need five years or more before they are ready to harvest. Most growers allow eight to 10 years before harvesting the root. Preparing ginseng root, whether it is for market or for your own needs, requires washing and drying the root before use. Dig the roots in the late fall or early winter after the tops of the plant have died back. Use a garden trowel or spade to perform this process, because you will want as much of the root intact as possible. Wash the roots immediately in a five gallon bucket filled with cold water. Use your hands to scrub away any dirt on the roots. Place the roots on screened drying trays and place the trays in a sunny area. The perfect temperature for ginseng drying is around 70 degrees F. Rotate the roots daily to ensure that all areas of the roots dry evenly. This process will take one to two weeks to complete. Process the dried ginseng by peeling the root. You can then use slices of the root in food dishes, soak slices in water for tea or grind the root for ginseng powder. Ginseng can be dried on trays in a low oven. Turn the roots every hour or so to promote even drying. This may take up to four days to accomplish. 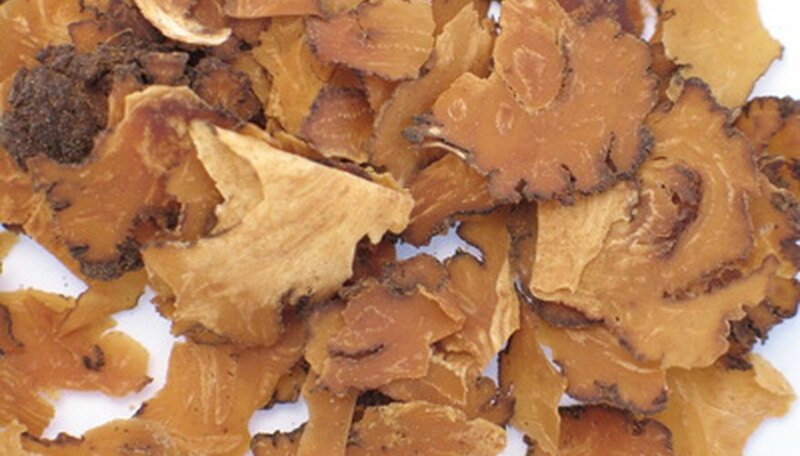 One pound of fresh ginseng will dry to around one-third of a pound. Check with the laws of your state if you plan to sell cultivated ginseng on the market. Many states have requirements and permits that need to be addressed before selling. You can use a spice or coffee grinder to grind the dried root for tea or use as a spice.